Fives designs and supplies custom engineered tooling solutions, including diamond and cBN cutting tools, diamond dressings tools and conventional and superabrasive grinding wheels including application support and services (on-site support, training and retooling). Key industrial markets served include aerospace and defense, automotive and truck, heavy equipment, oil and gas, rail, energy and medical. Within Fives, the Cutting Tools & Abrasives group designs and supplies custom engineered superabrasive tooling providing ultimate cutting and grinding solutions. 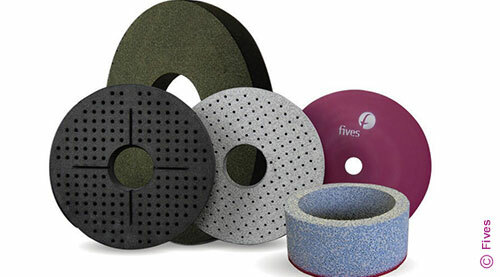 With a strong foundation based upon the renowned brands CITCO and Gardner, Fives is recognized as the preeminent provider of outstanding tooling and grinding solutions which are expertly designed to fit each customer’s unique requirements. With manufacturing and support operations strategically located worldwide, Fives and its Cutting Tools & Abrasives teams offer highly efficient technologies and solutions aiming at helping their customers in exceeding their objectives in terms of precision, high-performance and reliability. From design to operation and throughout the product’s life cycle, Fives proposes the ultimate solution to the customer and executes projects as a true partner. It is a value-added resource, with a global presence, a culture of active listening, and decades of expertise and experience of understanding and adapting to customers’ needs. CITCO tools has supplied solutions for the world's toughest metal cutting and abrasive machining applications since 1939. CITCO tools is the largest manufacturer of custom engineered cutting tools in North America with a highly motivated and experienced Managerial Team and worldwide customer base, the company remains at the forefront of technology. Providing the foundation required for the next century of progress, CITCO tools is committed to designing the tooling solutions of the future. Gardner abrasives was founded in 1905 by Frederick Gardner in Beloit, Wisconsin and is one of the world's most experienced suppliers of engineered abrasive products for all double disc grinding applications. Gardner's engineers use this extensive knowledge base to develop highly productive solutions to meet customer requirements for precision, quality and efficiency in their grinding operations. Gardner abrasives is also a world leader in the development of superabrasive products. Gardner offers a broad selection of diamond and cBN grinding wheels using advanced technology to meet the needs of manufacturers. It produces everything from high-volume automotive engine components to high-technology electronics and advanced ceramic composites. Superabrasive technologies available include metal, vitrified, resin and hybrid bonds, plus abrasive shapes, configurations and patented technologies. Gardner abrasive discs are custom-formulated from a range of carefully selected high performance materials, proven engineered formulations and established design criteria. Based on the customer's particular machine, process and component application, Gardner engineers select the optimum abrasive grain type and size, disc grade and structure, bond type, disc configuration, construction and mounting features to produce disc grinding wheels to meet any requirements.